Twenty-nine historic artifacts protected under an agreement between the City of Asbury Park, its waterfront developers, and a state agency have deteriorated over the past two years to the point of losing visual and structural integrity, according to a conservator who recently inspected the artifacts. The inspection identified three wall murals that have lost "significant" paint and are "beginning to lose their detail," and 26 metal letters that are rusting and in danger. Included on the endangered list is the Tillie wall mural, one of Asbury Park's most iconic images, long associated with Bruce Springsteen and the E Street Band. "A decision about the final disposition of these important historic objects should be put in place as soon as possible," said Paul Himmelstein, a New York conservator, who inspected the artifacts in their storage locations along Asbury Park's waterfront. Otherwise, he said, the historic authenticity of the artifacts is in peril. The threats discovered during the inspection brings into sharp focus several major dangers facing the removed artifacts, said Bob Crane, president of the non-profit group Save Tillie, which as part of its advocacy for preservation of the artifacts paid for the Himmelstein inspection. "This report very clearly demonstrates why storage by itself is not preservation," Crane said. "Preservation of historic resources requires frequent evaluation and the application of preservation treatments." Except for Himmelstein's privately funded inspections of the storage sites in 2005, 2014 and 2016, there is no evidence, Crane said, of professional evaluation, and none of preservation treatment by the owners. "Instead of preservation, we have deterioration that is, essentially, demolition by neglect." Furthermore, the original agreement to reuse the Palace artifacts in a new building rings hollow, Crane said, as there are no plans to construct a new building on the Palace site adjacent to Wesley Lake. Instead, there are economic incentives against new construction, since most of the site was transformed years ago into a lucrative street-level parking lot. Likewise, planners at the Madison Marquette waterfront development firm appear disinclined to relocate the artifacts to any site which is currently on the market for fear of tying the hands of potential buyers. "The City and the developers have financial conflicts of interest which have led them to avoid the 2004 agreement in favor of parking revenue and marketing priorities," Crane said. "As a result, the artifacts have been left to decay." This is not the situation the New Jersey Department of Environmental Protection specified when it issued the redevelopment permit in 2004, Crane pointed out. "By insisting on the preservation of Palace features, the state recognized that these artifacts are physical records of the events and people that shaped local history, and therefore provide meaning to life today and into the future. Historic artifacts provide economic and cultural value, which will be lost if these artifacts are significantly altered or destroyed." In 2004, he added, the state government offered Asbury Park a deal. Despite being listing on the National Register of Historic Place, the City and its developers could demolish Palace Amusement in exchange for a pledge to preserve and reuse the artifacts. "Well, the Palace was demolished and can’t be put back together," Crane said. "It is now time for the City and its developers to honor the pledge." In 2012, three of the protected Palace features were reported lost, prompting the New Jersey Department of Environmental Protect to issue a warning letter containing new reporting requirement to the City and Madison Marquette. Future violations, said state officials, were punishable by fines of up to $25,000 a day. Ten years back, developers demolished Asbury Park's historic Palace Amusements, after first agreeing to honor a State of New Jersey order to preserve 33 artifacts for eventual reuse in a new waterfront building. 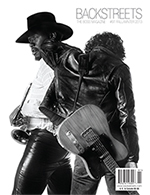 Among the artifacts was the Tillie wall mural, the backdrop for an internationally known photograph of Bruce Springsteen and the E Street Band taken in 1972. Two of the 33 artifacts have been lost by developers; the remainder are now in storage at various waterfront sites where their condition and preservation environments were recently inspected by Paul Himmelstein, a nationally prominent conservator based in New York City. Himmelstein first inspected the artifacts in 2005, a year after demolition, and following a series of major weather events, including superstorm Sandy, the Save Tillie preservation group arranged for the reinspection. Overall, Himmelstein reported, the artifacts are in "fairly stable" condition. The three large wall murals, painted on stucco-covered cinder blocks and stored in plywood sheds, appear to have survived Sandy with little water damage. However, the murals appear to have lost some paint, he said, and the rate of deterioration suggests the need for regular inspection. The most endangered artifact, he said, is the series of wooden cutouts depicting amusement scenes from the Cookman Avenue side of Palace Amusements. These were stored at ground level in the Casino building on the south end of the Boardwalk, where they appear to have been "soaked" by flood water from Sandy, causing considerable deterioration. Himmelstein called for removing the artifact to a dry, elevated location. The inspection of a sign and 26 metal channel letters was cut short owing to an inoperative lighting fixture in a storage area. From what he could see, Himmelstein said the metal items appear rusted, but stable. Himmelstein's inspection establishes a critical baseline for measuring the effectiveness of storage techniques by developers and the City of Asbury Park, especially since neither entity employes a professional conservator. This puts additional emphasis on Himmelstein's call for annual inspections as a way of preventing small issues from growing into larger ones. To date, the Madison Asbury Retail development firm, which is responsible for preservation of the artifacts, has rejected Himmelstein's recommendation. To read the full inspection report, please visit savetille.com. New Jersey state officials have ordered tighter security on historic artifacts removed from the Palace Amusements complex in Asbury Park following the discovery that two artifacts, designated for reuse in a waterfront display, are missing from a developer's storage area. By letter, the New Jersey Department of Environmental Protection instructed waterfront developers that none of the 31 surviving items can be moved out of current storage, or transferred to a new owner, without notification to State authorities. Furthermore, developers were warned that "failure to protect and preserve any of these artifacts" will be subject to substantial penalties. Missing from storage are a large overhead door decorated with wooden cutouts depicting a clown and Ferris wheel, and a sign for the "Shooting Gallery/Fun For All" attraction. The losses were first discovered during an inspection of waterfront storage sites by representatives of the Madison Asbury Retail development firm and Save Tillie, a non-profit preservation organization. Following the discovery, Save Tillie and New Jersey's largest preservation group, PreservationNJ, urged State officials to step in to ensure the security of the remaining artifacts. "When items such as these are lost, history is lost," said Bob Crane, president of the Save Tillie group. "Now, with only 31 items left, it is vital that the State control the security and reuse of the remaining artifacts." In 2004, the State granted permission to Asbury Park's waterfront developers to demolish Palace Amusements, a National Register of Historic Places complex at the corner of Cookman Avenue and Kingsley Street. The State, however, set conditions, requiring the developers to remove, preserve and reuse portions of the Palace for a historic display on a new waterfront building as mitigation for the loss of the iconic complex. The loss of Palace artifacts follows the disclosure earlier this year that 34 copper panels from the Paramount Theater/Convention Hall complex on the Asbury Park waterfront had been stolen during restoration work by waterfront developers. The copper has not been recovered. The Paramount/Convention Hall complex is on the National Register of Historic Places and has significant state and federal protection. The Department of Environmental Protection letter, dated Sept. 25 and released today, stressed that violations of waterfront rules can result in penalties of up to $25,000 a day for each violation. It was signed by Michele Kropilak, regional supervisor of Coastal & Land Use Compliance and Enforcement in the Department's Toms River office. The Environmental Protection letter also disclosed that for eight years, the City of Asbury Park and the waterfront developers have failed to notify the State which artifacts were preserved for eventual reuse. At a public meeting April 28, 2004, the City's Technical Review Committee approved the list of 33 Palace Amusements artifacts which were to be relocated and preserved, but, according to the State, the list was never sent to the State. Despite that failure, State officials notified developers that the surviving 31 artifacts now comprise the official list of items for preservation and reuse in a waterfront project. On March 3, 2005, then-Asbury Partners Chief Operational Officer Larry Fishman confirmed in a letter to the Save Tillie organization that all 33 artifacts had been removed and were in storage in three locations along the waterfront. More than 125 artifacts which had been saved from Palace Amusements, the National Register of Historic Places amusement arcade in Asbury Park, have recently been destroyed while under the protection of the City of Asbury Park and the community's Historical Society. City officials confirmed that artifacts were removed from storage at the City's Public Works Building, and said most were discarded to make way for a boxing gym on the building's second floor. The destroyed artifacts included murals from the Orient Express; most of the brightly colored Twister wall; murals and other artwork from the Fun House, including the hands of the Fun House giant; 27 murals from inside the Haunted Castle dark ride; and, in virtually mint condition, a sign from the Asbury Park Rock 'N' Roll Museum that had fallen behind a Sheetrock wall in 1988. The artifacts had been salvaged over five days of work in the spring of 2004 by members of Save Tillie, a non-profit preservation group, prior to demolition of the Palace during the early phase of Asbury Park's waterfront redevelopment plan. Johna Karpinski, president of the Asbury Park Historical Society, said only four Palace items of the lot were saved and that, in some instances, items were destroyed on the advice of the city's Fire Marshal, since combustible materials were used in their construction. In reality, however, "these irreplaceable items were all viable candidates for restoration, and all told a part of the Asbury Park story that is now lost," said Save Tillie President Bob Crane. "These acts of destruction serve to emphasize that in Asbury Park, historic artifacts stand a far greater chance of long-term survival in the hands of private collectors than in the care of authorized institutions." According to Crane, destruction of the items began over a year ago, and at no time was Save Tillie alerted to the impending loss or given a chance to reclaim the items it had jointly turned over to the City of Asbury Park and the Historical Society in 2004 for safekeeping. "We would have taken all of them," he said. Preservation advocates today denounced Asbury Park developers for defaultingby 1,000 dayson an agreement to care for protected wall murals, and urged New Jersey Gov. Jon S. Corzine to step in and resolve the dispute. In an April 26 letter, advocates said the care of three large protected wall murals, including one famous since 1973 for its association with Bruce Springsteen, has been "deliberately and maliciously" ignored despite pressure from both the State and the Asbury Park City Council. Efforts by municipal officials to compel compliance, they said, have failed. "A one-day default is a day too long," said Bob Crane, president of the non-profit preservation group Save Tillie. "To default by one thousand days is a thousand times worseoutrageous and deceitful and appalling." The default, he said, "derives not through miscommunication or benign neglect, but instead from deliberate and malicious intent. After 1,000 days of trying, we no longer believe any resolution is possible within Asbury Park." At issue is the fate of three protected murals. Negotiations during 2005 between the City of Asbury Park and its waterfront developers resulted in an agreement requiring the murals to be relocated into preservation sheds no later than Aug. 1, 2006. "That deadline arrived," Crane said, "and now, as of today, has been blatantly ignoredfor one thousand days." Preservation and eventual reuse of the murals in a new waterfront building is explicitly required by the State of New Jersey under a waterfront redevelopment permit, issued by the State. The murals are part of a group of 34 protected artifacts removed from Palace Amusements, a National Register of Historic Places complex on the Asbury Park waterfront, prior to its demolition in 2004. The Palace was a place frequently used by Bruce Springsteen as a lyrical reference point ("4th of July Asbury Park (Sandy)," "Tunnel of Love," and "Born to Run"), as a photographic backdrop, and as a featured image on memorabilia and videos. Images of the Palace, including the murals, also appeared in numerous movies and were prominent featured in several episodes to the hit television series The Sopranos. In 1998, a group of concerned citizens formed Save Tillie, a non-profit organization and registered New Jersey charity, after an announcement that the Palace was to be demolished. Two of the murals depict the historic amusement arcade's bumper cars. The third, known as Tillie, was background for the first nationally and internationally distributed publicity photo for Bruce Springsteen and the E Street Band, and rapidly became the most recognizable icon of Asbury Park to music fans around the world. On March 26, 2004, the State of New Jersey directed officials and developers in Asbury Park to preserve Palace Amusements artifacts and incorporate them in a new building that will eventually be constructed on the Palace lots. On April 5, 2006, following extensive negotiations between city officials and developers, the Asbury Park City Council passed a resolution requiring relocation of the murals into preservation sheds. Earlier, a nationally known conservator said previous preservation efforts left the murals in danger of decay. The Council resolution set a deadline of Aug. 1, 2006 for completion of the move. Crane said "the deadline has not been fulfilled; instead, Asbury Partners has left the murals unmoved for 1,000 days beyond the deadline, and the City has been unable to compel developers" to live up to their agreements. "If this situation is allowed to stand," Crane wrote, "what legal right or moral authority will the City of Asbury Park have to compel any other citizen to live up to a negotiated agreement with the City? What authority will the State of New Jersey have to enforce the conditions of future permits? And what does a 1,000 day default, left unresolved by a municipal government, say about respect for the law? What it seems to say is that if you are a developer operating in Asbury Park, you are immune from adherence to both the letter and the spirit of the law. Respect for the law means acting with deference and esteem, and a sense that the law has value over and above its immediate application. None of that is evident in the actions of the holders of the Asbury Park permit. There is, especially on the part of the developers, an intentional disregard for the law that spirals into a disrespect for the rights of others." The Asbury Park City Council approved an interim storage location for the murals. City of Asbury Park Planning Director Don Sammet repeatedly, but without success, pressured Asbury Partners to live up to the requirements of the City Council Resolution and the State permit by moving the murals to the interim storage location. City of Asbury Park City Manager Terance Reidy, in June 23, 2008 correspondence with Save Tillie, said that "Don (Sammet) and I reminded the (City C)ouncil that Asbury Partners are in default on this issue." City Councilmember Jim Keady openly pressured Asbury Partners at a Sept. 4, 2008 meeting of the Asbury Park City Council to complete the relocation of the murals. "Yet despite these actions and others, it is plainly evident that the City of Asbury Park has failed in its efforts to require Asbury Partners to live up to its legal obligations," Crane said, noting that the City has both the legal authority and specific tools, including mediation, to compel compliance. Developers promised the State, the City Planning Director, the City Manager, the City Council, and others that the murals would be moved. Developers even prefabricated replacement sheds two years ago, but have not put them into use at the new storage site. In one instance, the developers sought bids on moving the murals. The bid document was written in such a way that had it been followed, the murals would have been destroyed during the move. When the winning bidder discovered the flaws, he withdrew his bid. In December 2007, developers offered Save Tillie a deal. Let them off the hook on the requirements of the State permit, developers said, and they'd build something Save Tillie would like "in the spirit" of the original murals. Save Tillie refused. In late October 2008, during a meeting called by City of Asbury Park Planning Director Don Sammet, Keith Ortner, representing the developers, promised to present to the City and to Save Tillie a plan for moving the murals "within two weeks." No plan has ever been received. "When the holder of a State permit thumbs its nose at the State for 1,000 days, and when the holder of a State permit deliberately defaults on a legal obligation for 1,000 days, there can be no doubt that that entity has no respect for the operation of government, and intends to operate without respect for the requirements of law," Crane wrote in the letter. The New Jersey Department of Environmental Protection blocked Asbury Partners from attempting to relocate the murals to a site DEP deemed "unacceptable." In plain language, DEP uncovered an attempt by developers to relocate the murals into a high velocity wave zone on the Asbury Park beach, where they would face destruction from a major ocean storm. "The Department's action was timely, and appropriate." Crane wrote. DEP also vowed by letter of Sept. 6, 2006 that it would "continue to ensure that the permit is complied with." Unfortunately, Crane said, "DEP's vow today rings hollow. At no point during the 1,000 days of default has the Department used its enforcement power to insist that the murals be moved to the new location. As a result, the Palace condition contained within the State permit remains violated." By law, the State of New Jersey has the authority to take action against those who violate the Coastal Area Facilities Review Act by direct order, civil action, or civil administrative penalty of up to $25,000 for each violation, with each day during which a violation continues constituting an additional separate and distinct offense. APP: "IMMEDIATE STEPS SHOULD BE TAKEN"
"Don't let Tillie just fade away"
Asbury Park is poised to reach new heights. But it shouldn't come at the expense of its glorious past. Tillie, the iconic face of the city and lowbrow equivalent of the Mona Lisa, is moldering away in a shed not designed to fully protect the mural, which once adorned the walls of the now-demolished Palace Amusements building and was made internationally famous by its use in promotional material for Bruce Springsteen and the E Street Band. The same fate has befallen two other murals from the same building depicting a joyous bumper car ride. Immediate steps should be taken to adequately protect the artwork until a permanent home for it is found. Four years after Asbury Partners contractually committed to preserving and eventually reusing the mural, Tillie rests in a shed on the grounds of Asbury Park's wastewater treatment plant. Two protective sheds made of stronger materials and built according to the specifications of a private conservator to control air flow and moisture, sit empty on city property. Madison Marquette, which now has the legal responsibility for preserving the murals, should transfer them immediately to ease growing concerns about the deterioration of the famous face. Unfortunately, Asbury Park hasn't pressed Madison Marquette forcefully enough to honor its commitment. If the developer continues to stall, the city should press harder. If necessary, the City Council should use the issue as leverage in negotiating a new redevelopment agreement with Madison Marquette. As a last resort, the city should move the murals and bill the developer for the cost. Former Asbury Park council member Kate Mellina says of the whole sad, sorry mess, "I'm convinced that Madison Marquette is intent on seeing the murals destroyed. There's no other explanation for the delay." Let's hope that's not the case. Let's hope that given all Madison Marquette has had on its plate, moving Tillie to a safer place has not been high on its list of priorities. If so, it's time to move it up. One of the saddest love-gone-wrong lines in Springsteen's catalog is "I don't want to fade away." Tillie needs to be spared that fate. It's simple, really. You own property close to the shore. You want to build. Because the shoreline is regulated, you seek a permit. New Jersey says: meet these conditions, and you're good to go. If your construction project is worth, say, $750 million, chances are you'll make sure those conditions are met. Unless your name is Asbury Partners or Madison Marquette. For the past four years, Asbury Park's developers have played fast and loose with a state requirement to preserve artifacts from the historic Palace Amusements, artifacts that were given protection as a condition to rebuilding the city's waterfront. The Palace was one of the few National Register of Historic Places structures in Asbury Park, once home to a classic 19th century carousel, a roundabout that carried passengers above the rooftop, and wall murals, the memories of which still connect generations of visitors to the community. New Jersey's historic preservation director said the Palace could become the centerpiece of renewed tourism. Yet from his first day in town, Asbury Partners' Larry Fishman couldn't wait to tear it down. When the state issued its waterfront permit, it told Fishman that if he preserved Palace artifacts for use in a new building, he could demolish the arcade. Asbury Partners drew up a list of 33 artifacts, including three large wall murals. The city signed off, and Fishman sent in the bulldozers. The basic techniques of historic preservation are widely understood. Preservation means to maintain in safety and to keep in an unaltered condition. To the developers, however, "preservation" seems to mean something quite different. First, they stuck the Palace murals in two poorly constructed outdoor storage sheds, built without the advice of anyone who understood preservation. A true preservation shed facilitates the flow of air and humidity. The Partners' sheds  constructed of used, interior-grade plywood  work in reverse, limiting elements needed to stabilize the murals. One shed tilted against a wall in a windstorm; both sheds leak. When Asbury Partners "repaired" shoddy workmanship, many problems worsened. Faced with mounting criticism, including an investigative report by a nationally prominent conservator, Fishman met city officials on Sept. 26, 2005, and famously told his staff: "We've done it wrong twice, now let's do it right." What, exactly, does "let's do it right" mean? Today, two and a half years later, the murals sit in the same sheds, in the same deplorable condition. The developers' second tortured strategy involved moving the murals to a new location. Prodded by the city to move them from a secure area outside the sewer plant, the Partners agreed to an Aug. 1, 2006, deadline. At first, Asbury Partners offered to relocate the 52-year-old murals onto the beach, with new sheds. However, Fishman's preferred site turned out to be unacceptable to the state, located in a high-velocity wave zone that would endanger them during storms. Asbury Partners next focused on a city-owned lot west of the train station. The wisdom of this location was never explained. The developers own 57 acres of waterfront land. Ultimately, the murals must be reused in a new building at Kingsley Street and Cookman Avenue. So why move three large murals not once, but twice, all the way across town? Nonetheless, the developers sought bids for the move, but strangely forgot to disclose some basic details  for instance, that the murals' steel frames must be welded to a truck bed to keep them from falling over. In another strange oversight, the company that successfully removed the murals from the Palace four years ago wasn't given the opportunity to bid. Eventually, the winning bidder withdrew when he realized the job was a prescription for failure. Today, with Madison Marquette now responsible for preservation, the murals sit where they have since summer 2004, in leaky, poorly constructed sheds that serve virtually no preservation purpose. The city's deadline has come and gone, with no consequences. An assurance given to the state that the murals would be moved has been ignored, again without consequence. In fairness, Asbury Partners did prefabricate replacement sheds that are designed to be waterproof and to allow natural levels of heat and humidity to reach the murals. Unfortunately, these sheds have never been used and remain stacked inside the Sunset Avenue Pavilion, gathering dust. Based on everything done and left undone, the developers seem to believe they can avoid their preservation responsibility by allowing the murals to decline. That's nonsense. Any change in the condition of the murals since 2004 is their responsibility. Penalties could be costly and embarrassing, and could slow redevelopment. It's now time for the state or the courts  with the city's active encouragement  to enforce the state preservation requirement. The dark shadow cast by the deteriorating real estate market has reached Asbury Park. In early December, developers halted work on the 224-unit, partially built Esperanza high-rise, citing as the cause the national sub-prime mortgage crisis that some experts predict will last until at least 2010. In some regards, the stop-work order triggers flashbacks to the failed waterfront redevelopment project in the late 1980s. Asbury's redevelopment attempt back then was stopped dead in the tracks by a catastrophic downturn in the housing market, plunging the City into 15 years of economic depression. One of the lasting symbols of the earlier failure -- the unfinished skeleton of a waterfront high-rise -- stood until imploded in 2006 on exactly the same site as the now unfinished Esperanza. What this eventually may mean for those who care about the Stone Pony, Madame Marie's, and the wall murals removed from the Palace, is currently unclear. There are hints, however, of darker days to come. In 2004, the State of New Jersey gave developers a permit which allows for the rebuilding of the Asbury waterfront, and in exchange required developers to preserve, and eventually reuse, historic artifacts including the Tillie and Bumper Car wall murals from the Palace. Since then, the developers who make no secret of their disdain for the murals have consistently tried to outflank Tillie's supporters in the Save Tillie organization. When Save Tillie produced evidence that the storage sheds containing the murals would eventually lead to destruction of the murals, developers promised to move the murals to new sheds at a new location. That location turned out to be on the beach, where the murals would be destroyed by an ocean storm. The State stepped in, and blocked the move. Then, the developers offered to move the murals to a more secure location, and sought bids on the move. When Save Tillie reviewed the bid, it discovered that bidders had been misinformed on the height and weight of the murals, and had not been required by the developers to secure the murals to the moving truck. When the winning bidder learned these facts, he backed out and the move was cancelled. Had the move gone forward as planned by the developers, there was an excellent chance the murals would have toppled from the truck and been destroyed. The latest maneuver came a few weeks ago, when developers invited Save Tillie to meet and discuss cooperative measures regarding the murals. As it turned out, "cooperative" meant that the developers wanted Tillie supporters to agree to destorying the murals and to letting the developers create some sort of replacement in "the spirit" of the originals. That suggestion was flatly rejected by Save Tillie. At the same meeting, developers said they plan to eventually close the Stone Pony and recreate it elsewhere. So now, as 2007 ends with a dark shadow creeping over the entire waterfront project, the well-being of Palace artifacts and historic waterfront places is once more in question. There are very few artifacts of the Palace left, and none more prominent than the Tillie mural, under which Bruce Springsteen and the E Street Band posed for one of the band's most famous early photographs. There is no place in Asbury Park more closely associated with Bruce than the Pony. If you want to make a safe prediction for 2008, bet on these issues heating up again soon. The Palace no longer stands at the Asbury Park intersection of Kingsley and Lake, but one of the most popular coin-operated attractions from the historic amusements arcade has returned to Asbury Park, 15 years after it was sold to shop keepers in Vermont, and is now a major attraction at a Cookman Avenue store. 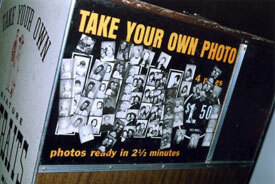 For over three decades, the Palace's photo booth produced strips of four black and white wallet sized photos of visitors to the Shore side amusement park. Now refurbished by the Save Tillie preservation campaign, the booth is back in service on the lower level of The Shoppes At the Arcade, 685 Cookman Ave. The booth entered the Palace in the late 1950s and remained in operation there until the Palace closed in late 1988. For a time thereafter, it operated at Sandy's Arcade on the Boardwalk, and eventually was sold to Vermont shop keepers, who operated the booth in stores in Burlington and Bristol before donating it to Save Tillie last winter. Save Tillie member Dan Toskaner refurbished the operating mechanisms of the booth over the winter and spring, giving it a new strobe light and making other mechanical improvements. In appearance, however, Toskaner said the booth will be completely familiar to those who used it at the Palace, down to a collage of very old photo strips including pictures of employes of the Palace and Sandy's Arcade. Come on by and give it a try! Asbury Park's famous photo booth, sold to Vermont shop owners after more than three decades of operation at the Palace and a later Boardwalk attraction, has been donated to the Save Tillie group and is being refurbished for eventual return to the city. 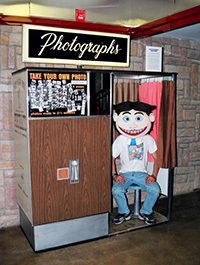 The booth, which produces a strip of four black and white wallet sized photos, was installed in the Palace during the late 1950s where it became one of the most popular coin-operated attractions at the Shore side amusement park. Considering the age and history of the booth, it's in remarkably good condition. Save Tillie members are installing a new strobe unit, thoroughly cleaning the booth and overhauling all of the internal mechanisms. When done, they expect the booth will be immediately recognized by all who enjoyed it at the Palace. On November 27, 1988, 100 years of Asbury Park amusements history came to an end when Sam and Henry Vaccaro, last of the owner/operators of the Palace, shut down the business following years of sagging revenues. Signs soon appeared on the Palace doors announcing the sale of amusements, many of which were snapped up by collectors and investors at bargain prices. The booth moved for a time to Sandy's Arcade and Amusements, a Boardwalk arcade, but was again put up for sale in the late 1980s. The sales notice caught the attention of Slim and Pamela Smith, Jersey Shore natives who had migrated to Vermont but were vacationing near Asbury Park. Racing over to the Boardwalk, they purchased the booth and moved it to Vermont. For a time it was in their Burlington store known as Folkheart, and then eventually was moved to a second Folkheart in Bristol. In December 2006, Pamela Smith offered to donate the booth to Save Tillie when Folkheart was closing its doors for the final time. Save Tillie members Dan Toskaner of Scarsdale, NY, and Frank Saragnese and Mary Lynn Purcell of Ocean Grove, NJ, drove to Bristol on December 27 to accept the donation. Toskaner, an authority on amusements and amusements history, is in charge of the refurbishing project. "The exterior oak and the white/gold speckled Formica is completely intact," Toskaner said. "The illuminated script 'Photographs' sign still sits on top. In recognition of its history, someone stamped a small Tillie face next to a handwritten $2.00 sign." Best of all, Toskaner discovered "a homemade collage of very old photo strips under a sheet of plexiglass on the side of the machine. Pamela Smith confirmed that these strips were already there when she bought the booth, which means that the photos were taken in Asbury Park." Over the last weeks, Save Tillie has begun identifying individuals in the photographs, and is appealing for help in identifying the rest. Those identified so far include Henry Vaccaro Jr., son of the Palace's last co-owner and now president of Vaccaro Guitar Co., in Asbury Park; the late Leroy "Shorty" MacDowell, a maintenance man at the Palace; John O'Heney, who for a time managed Sandy's Arcade and Amusements on the Boardwalk and now owns F Stop Photos in Belmar; and Dathan James, who also worked at Sandy's and is now a Target employee in Ocean Township. The rest of the individuals remain unidentified. Their photos are online at savetillie.com under the heading "Original Palace Photo Booth Donated to Save Tillie." Anyone who can help identify them is asked to contact Save Tillie at pbjcrane@erols.com. THE PALACE MUSEUM - ONLINE NOW! A new website dedicated to the 116-year history of Palace Amusements launched May 26, 2004, the first anniversary of the day when developers in Asbury Park began demolishing one of the most identifical physical landmarks associated with Bruce Springsteen. Until that day, the Palace was a landmark on the Jersey Shore, a place that excited 10 decades of visitors and inspired songwriters, photographers, and artists. The Palace carousel was one of the nation’s greatest, and the Ferris wheel carried passengers for more years than any other wheel in American history. The Palace Museum Online is the result of nine months of research by members of Save Tillie, the organization which rescued more than 125 artifacts from the Palace prior to demolition. Among the rescued artifacts was Tillie, the iconic wall mural that is now in storage for reuse on a new building slated for construction on the Palace lot at the intersection of Cookman Avenue and Kingsley Street. 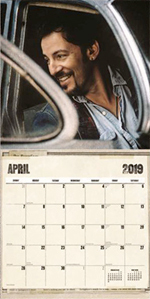 Through the years, Springsteen wrote Palace referrences into songs including "Born to Run" and "Tunnel of Love," used images of the Palace on tour tee-shirts, official calendars and in videos, and posed for a number of photographs inside the Palace and out. Footage of Springsteen riding the Palace carousel along with a tattooed man, midget, dancing bride and other distinctive characters was shot on Nov. 11, 1987 for inclusion in the "Tunnel of Love" video but was not used. Springsteen was among the featured artists in the Asbury Park Rock 'N' Roll Museum located in the Palace from 1986 until the Palace closed in late 1988. Demolition by Asbury Partners, the city’s waterfront development firm, was conducted under terms of a permit issued by the State of New Jersey stipulating that a number of Palace artifacts be removed and preserved for eventual reuse in the new building. A separate agreement, between the developers and the City’s Technical Review Committee, identified those artifacts as two wooden cutouts, 26 large metal channel letters, several signs, and three large murals - Tillie and two murals depicting riders on Palace bumper cars. Demolition was opposed by the National Trust for Historic Preservation, Preservation New Jersey, the Asbury Park Historical Society, and Save Tillie. The website documents a number of little-known chapters in Palace history, including acute racial tensions in 1889 over the right to ride the Palace carousel, the relocation of a Palace band organ to a museum in Georgia, the near-death of a Palace mechanic while working on the carousel, and the development of the first Palace dark ride using electrified equipment that had previously operated in dark tunnels under the sidewalk at Ocean and 3rd Avenues. The site, at www.palaceamusements.com, also includes a guest book where Palace fans are invited to share personal memories of the historic arcade. Fifty-eight people donated photography, research, interviews and writing to the project. Seth Brahler, a Save Tillie member from Ithaca, New York designed the site. Tillie and Palace images have been used by Bruce Springsteen on tour tee-shirts, tour books, calendars, videos, and the cover of the "Lonesome Day" CD-single. John Sayles' "Baby It's You"
Robert DiNiro's "City By The Sea"
For more news, please visit the Save Tillie web site. If you'd like to comment, or be part of the Save Tillie campaign, please get in touch with us at pbjcrane@erols.com. 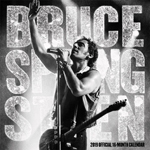 Official Springsteen calendars from Thrill Hill now in stock for the new year!